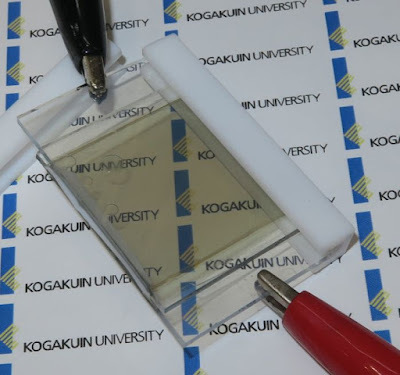 A Japanese research group prototyped a translucent lithium-ion (Li-ion) rechargeable battery that can charge itself by using sunlight. With the battery, the group aims to realize a "smart window," which is an almost transparent window that functions both as a large-area rechargeable battery and as a photovoltaic cell (when the window receives sunlight, it is pigmented, lowering light transmittance). The group is led by Mitsunobu Sato, president of Kogakuin University and professor at the Department of Applied Physics, School of Advanced Engineering of the university. The battery was exhibited at Innovation Japan 2015, a trade show that took place from Aug 27 and 28, 2015, in Tokyo. The group developed a translucent Li-ion rechargeable battery and announced it in a thesis in 2013. The main component of the electrolyte used for the positive electrode of the battery is Li3Fe2(PO4)3 (LFP). And those of the electrolyte used for the negative electrode are Li4Ti5O12 (LTO) and LiPF6 (lithium hexafluorophosphate). Those material are commonly used for Li-ion rechargeable batteries. However, oxides are basically transparent, and the thicknesses of the positive and negative electrodes are only 80nm and 90nm, respectively, realizing a high light transmittance. The light transmittance for green light (wavelength: about 550nm) is about 60% after discharging. It lowers to about 30% after charging because the density of lithium changes at the electrodes and the electronic state (valence) of the material changes. The output voltage of the battery is about 3.6V. And the research group confirmed 20 charge-discharge cycles. This time, the group exhibited a device that has not been announced in a thesis. It was made by making some changes to the materials of the translucent Li-ion battery announced in 2013 so that electrons excited by light coming to the negative electrode can be used to charge the battery. At the trade show, the group showed the results of an experiment in which optical charge and discharge are repeated five times by applying near-ultraviolet light with an output of 10mW/cm2, which is about 1/10 that of sunlight.